Some lawyers were concerned when the Model Rules of Professional Conduct were changed to include a comment that competence as a lawyer included an appreciation of “the benefits and risks associated with relevant technology.” Many states began adopting this language into their own version of the rules with some variance in language. Lawyers practicing in the family law arena have had to learn about preserving social media evidence and getting it admitted in hearings as many people post things on social media that are very relevant to their custody battle or other claims they may be making in court. Today, merely signing up a new family law client and giving them basic initial advice requires technology competence on the part of the family lawyer. An article that appeared in The New York Times this summer3 reminds us increasing reliance on technology tools and the emergence of the internet of things (IoT) has multiplied the ways a bad actor in a divorce case can use technology to intimidate or torture their soon-to-be ex-spouse. Others reported accounts of the thermostat suddenly turning up to 100 degrees or smart speakers suddenly blasting music. Today many homes also have security cameras, webcams connected to computers or a PlayStation with a camera. Any digital camera connected to the internet can be a tool for privacy invasion if controlled by someone outside of the home. Often the home technology has been set up by one partner in a relationship with the other partner having limited understanding of its functions beyond the basic details. 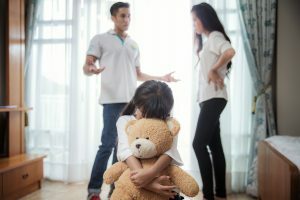 As experienced family lawyers know, there are so many things happening with a marital split that online technology and its impact on security and privacy may not be foremost in the client’s mind unless their lawyer assists them with solid advice. I haven’t practiced family law in many years, so none of this applied when I was practicing, but I thought I’d take this opportunity to outline a few things to tell a new family law client about how a separation or divorce impacts the technology they use every day. All family lawyers likely warn their clients today about posts on social media which could harm their case. It is likely best to give several examples to assist the client in understanding how even innocent factual posts can be used in a divorce proceeding. In the early days of social media, some lawyers advised their clients to deactivate their social media accounts or never use them while the divorce case was pending. This is not a practical alternative for many of today’s clients, but at a minimum, they should be warned they should not post anything about their estranged spouse. Certainly, there are a few exceptions, such as pictures from a child’s birthday celebration where both parties attended, but they should be rare. A few words about how “party pics” may come across in the courtroom might also be in order. However, updating email passwords is just the beginning of the journey where password security sharing and remote access are concerned. For example, it is convenient to be able to check remotely to see if someone forgot to close the garage door or to open it remotely when your neighbor needs in to borrow a tool, but it is dangerous for someone to be able to open your garage door remotely and leave it open all night. Here is a nonexhaustive list of things you might want to discuss with your client and perhaps provide them with a handout/checklist. Change your email password on every email account. Change the home Wi-Fi network password. This should interrupt the connection to every device in the home using Wi-Fi. Only reconnect the devices to your Wi-Fi using the new password that you actually want to use. You may decide not to reset something like the internet-connected lock on your front door for a while, but with smart locks and internet-connected thermostats, you also may have no other option. Some devices may have a reset button to assist you, but don’t forget that even if you have lost the installation instructions, you can likely locate them online by searching the name and model number of the device. Talk to your children about internet security and safety and about sharing the Wi-Fi password with their friends. You might have a rule that every time they share the password with a new friend they have to send you a text message with the friend’s name. You must have a lock code on every phone and portable digital device you and your children use. If you already have lock codes, reset them all. iPhones bring some particular concerns. Many couples sync their iPhones to share information and married couples often share an Apple ID or iCloud account, which gives access to emails, messages and other data without the other spouse knowing. This could lead to unanticipated consequences like that old iPad no one uses anymore still displaying text messages sent to you. Depending on your level of expertise, you may need professional help “unsyncing” devices or separating accounts. Don’t forget that if someone has your Apple ID and password, they can use Find My iPhone to determine your physical location within a few feet at any time if you have your phone with you. If your cable TV service, streaming service or internet service provider is set up in both parties’ names, then each has full access to much information, which may include remote login capability, data use and websites visited, pay-per-view movies watched, web-based email and other data. Get that changed as soon as possible. (Attorneys will want to advise about the impact of the automatic temporary injunction on this.) There is also likely a password, a PIN and security questions with these accounts that should all be changed. Never use your work email account to correspond with your lawyer or to discuss private matters with anyone. Your employer has access to all that information via the network. The passwords for every additional online service you use should be changed and the security questions examined. This may take some time, so do the important ones first. Webcams connected to computers or the internet should be physically covered when not in use. This has less to do with your divorce and more to do with protection against hackers generally. You can buy inexpensive webcam covers for laptops with installed cameras that slide to expose the camera lens when you want to use it and can be closed when not in use. Does your telephone answering machine have a feature where someone can listen to the recorded messages remotely by calling your number and entering a code? If so, that code needs to be changed. If you have a home security system, you may need to contact the monitoring service to understand where the data is stored and how it operates. You want to know if videos of visitors to your home are stored and for how long, along with how they are accessed. There may be a PIN or password associated with that service. If you have a do-it-yourself setup, you may have to do some research on how to reset it. If you have particular privacy or security concerns, you may ask friends not to “tag” you on social media or post photos of you at an event until after you have left. That’s a longer list than I intended, but it covers the basics. The executive summary is change your email password, change your home Wi-Fi password and then change passwords for any website that allows access to money or allows charges on your credit card. Whether you call it technology competency or just good client service, today’s world requires lawyers appreciate the risks that we all face when using technology tools. You don’t want to be the lawyer who sees your client being interviewed on the evening news broadcast or in the local media on how the client’s connected home somehow became a modern-day haunted house. Mr. Calloway is OBA Management Assistance Program director. Need a quick answer to a tech problem or help solving a management dilemma? Contact him at 405-416-7008, 800-522-8065, jimc@okbar.org. It’s a free member benefit! 3. Nellie Bowles, “Thermostats, Locks and Lights: Digital Tools of Domestic Abuse,” The New York Times, June 23, 2018, www.nytimes.com/2018/06/23/technology/smart-home-devices-domestic-abuse.html.